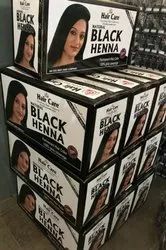 We are engaged in offering comprehensive range of Black Henna that is manufactured using extreme quality of natural herbs as a raw material. Apply this paste on hair with a brush. Comb the hair after five minutes so that the paste should reach in the roots of hair. If any whiteness is observed apply more paste on that portion. Ensure that the paste is completely applied on hair. Later on wash with soap or shampoo. To check the particular shade of color and whether the color is suitable for a particular skin or not there are two tests. Clean and wash a small area of the skin behind the ear or upon the inner surface of the forearm using soap and water. Prepare a small quantity of paste, apply to the area and allow it to dry. If no irritation, itching, reddening, swelling or inflammation is experienced in or around the test area it may be assumed that no hypersensitivity to the colorant exists. Color should be kept away from direct sunlight & preferably in a dark place. The packet of Color should be opened only when ready to use. The color should be mixed only in a plastic or glass bowl and not metal bowl. The paste should be applied with the application brush. Paste should be used immediately after preparation, (within 4-5 minutes) other wise it may not be effective. Take proper care to ensure that color solution does not go into your eyes. The preparation should not be used for dying eyebrows or eyelashes as severe inflammation of eye may result. In case the paste gets into eyes, the same should be rinsed immediately. 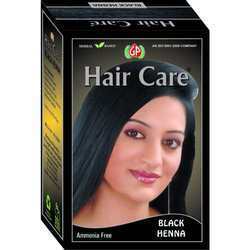 Black Henna Henna hair dyes, henna based hair dyes, herbal hair dyes, herbal henna hair dyes imparts Black color to your hair which makes coloring easy. It spreads quickly and evenly right to the roots of your hair and gives silkiness and shine, leaving your hair soft, fragrant and delight fully manageable.